As for relievers Josh Roenicke, Casey Janssen, Jeremy Accardo and David Purcey — all scheduled to follow Marcum — they will now pitch on Monday after Brian Tallet’s five-inning start. Relievers Kevin Gregg, Scott Downs, Jason Frasor and Shawn Camp will pitch in a Triple-A game on Monday. That works out great. I look forward to seeing Roenicke pitch and if Purcey can actually throw a strike for once in his life. 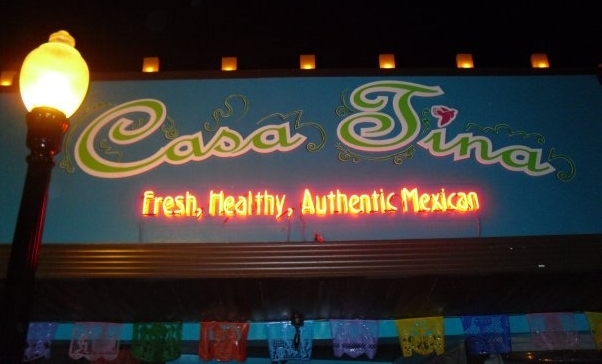 Last night I hit up Casa Tina’s . After eating there I can officially say that they have the best authentic Mexican food in the world I have ever had outside of Mexico. You can also become a fan of Casa Tina’s on Facebook. Their menu is extensive and very authentic. 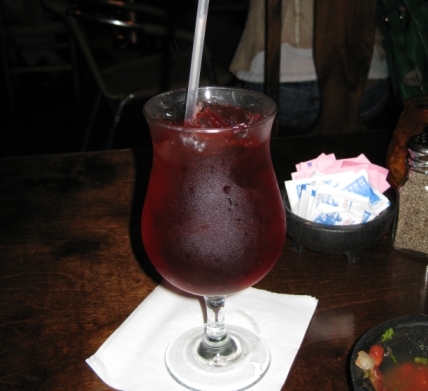 During many of my stays in Mexico I was fortunate to try an iced tea made from the leaves of Hibiscus flowers – known as “Jamaica” (not pronounced like the country, it is pronounced Ha-my-ca). It was on the menu at Casa Tina’s and I had to have it. Legend has it that it cures hangovers. I can’t confirm or deny this claim. However, it was even better than what I had tried in Mexico! They also have an extensive collection of Mexican beers. In my opinion, Mexican beers are the greatest in the world, no question. 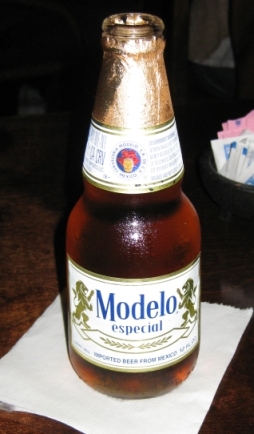 Keep your Canadian beer – it can’t hold a candle to Mexican. 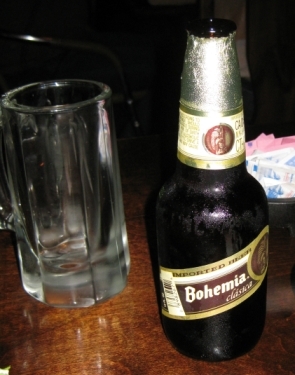 Although my favourite Mexican beer wasn’t available (Superior), they did have the next best thing(s) – Bohemia & Modelo Especial. Make sure to try them if you can and then tell me how Molson Canadian or Labatt Blue stacks up. The fish of the day was Sea Bass. For those who don’t know, sea bass is one of the tastiest fish around yet it is notoriously difficult to cook. It was done in a garlic/butter/white wine sauce with cilantro. MmMmm. I ordered it up and it was mind-blowing. The only time I had better fish in my life was in Mexico where it comes fresh out of the sea and is cooked whole on a stick. They cooked the Sea Bass to perfection. 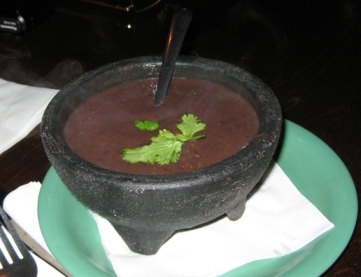 For you black bean soup fans (I know you’re out there!) I had that too. It was blended with chorizo which added an interesting element. 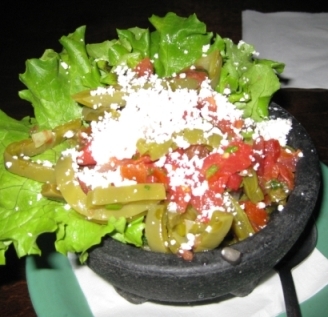 They also have cactus salad so I hit that up as well. No, I didn’t eat it all. Or close to it. Below is some footage of my new favourite restaurant. Casa Tina’s menu can be found here. While the rain was coming down and the Jays were working out indoors, I rolled out of bed and rolled next door to Lenny’s for breakfast. I spoke about Gregg Zaun’s former haunt here. It deserved a second visit. When deciding what to have, I saw an item on the menu that I didn’t recognize – “scrapple.” I asked the server, and as I mentioned on twitter, she told me that scrapple is the leftover meat after making hot dogs. I thought that hot dogs were leftover meat. What could scrapple possibly be? To top it off you could smother it in pork sausage gravy to complete the atrocity. It is a testament and credit to Lenny’s that despite hearing of that violation towards nature I still didn’t lose my appetite. 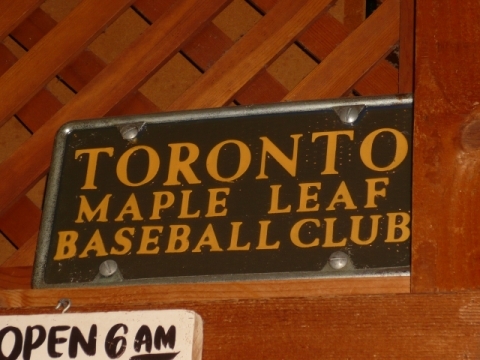 There was even a Toronto Maple Leafs Baseball Team license plate in the restaurant. I wonder how that managed to end up in Clearwater? There was also the dude who makes things out of balloons. I was that guy and had one made. This was supposed to be the Jays logo. Good enough, no? The soundtrack for this trip has been old faithful WMNF 88.5 as recommended to me by Jeff Blair. I definitely recommend hitting it up for the most eclectic music mix around. For instance, today I hear a classic Stones strut-worthy song “Can’t You Hear Me Knocking” followed up by one of my favourite Spanish guitarists, Ottmar Liebert. Can’t you hear me knockin down your dirty street, yeah! 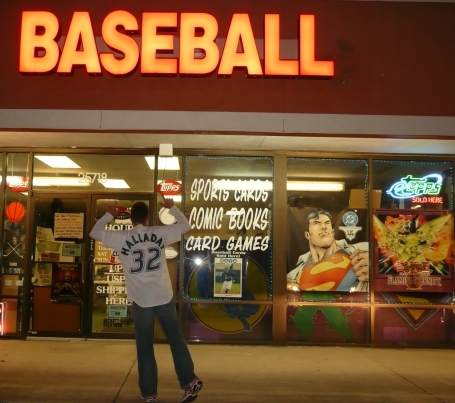 One other thing before I forget – I hit up a baseball card shop called “Baseball” (they are actually called “Wonder Water”) That was good enough for me, I had to go in. I was looking for Topps 2010 packs but they were sold out. They promised to bring some in from their other store by tomorrow (today). So I showed up today and they were all sold out of the ones they brought over. I didn’t realize how popular they were! For my troubles they gave me one of the Topps unlockable cards – which turned out to be a 1988 Mike Schmidt – for free. That was pretty nice of them! They have over 1 million cards in stock and you can order them only from wonderwater.beckett.com Their prices are very reasonable. Give them a look, won’t you? That about does it for today. I’ll be seeing my final game tomorrow, Jays vs. Tigers at 1:05pm before I fly back to Ontario on Tuesday. I will do my best to take as many pictures as possible, record as many videos as possible, make as many random observations as possible and drink as many beers from Chad the Beer Guy as possible. 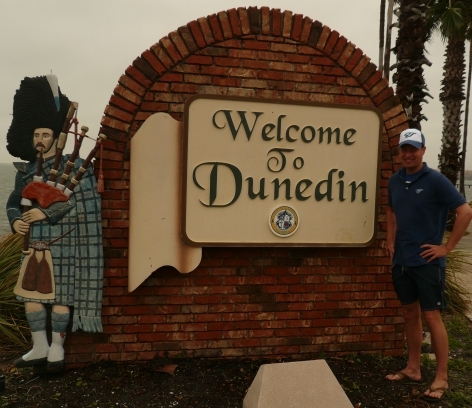 Not sure what I’ll hit up tonight – I am debating between the Tilted Kilt and the Dunedin Brewery. Any suggestions? I’ll post what I can from my last game either tomorrow evening or Tuesday morning. Although I am sad that tomorrow is my last full day, I’ve had a great time so far bringing the Spring Training experience to you. Let me know if there is anything else you would like to see. Thanks for riding along! See you tomorrow – and make sure to follow me on twitter for in-game updates and twitpics.. unless Chad the Beer Guy makes that impossible. He is so seductive and tempting. P.S. Tomorrow we have tentatively scheduled a roundtable from all of our favourite bloggers and mainstream media types. 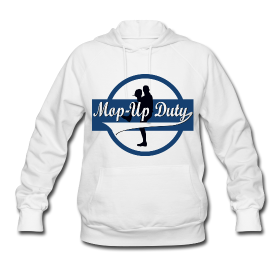 Make sure to come back and check it out once it is posted! 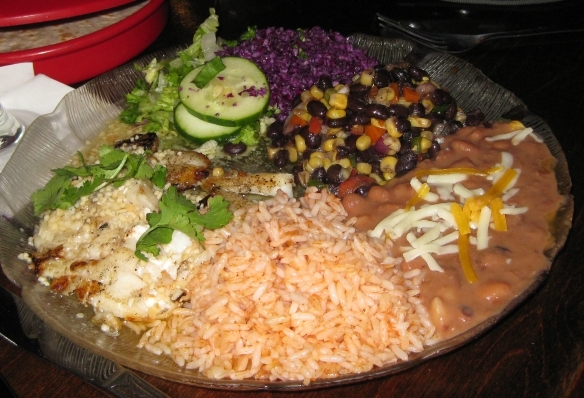 We liked Casa Tina so much, we went twice. Soooo good. I’d vote Dunedin Brewery for tonight, but OTOH, Tilted Kilt is stumbling distance back to the hotel for you. Always more fun when you don’t have to drive. Oh – and scrapple = American haggis. A quick wiki search of the Maple Leafs shows they were Philly’s AAA affiliate for much of the 40s, back when it was the A’s, and from 48-50 when the Phillies came along. That’s my guess, anyways. Nice find, I’ll have to remember to check it out next year. Thanks Jeff. Way to connect the dots. I didn’t know they were once an A’s affiliate. Nice find. Qué tal. Solo queria que he llegado aquí a través de Gooogle y me útil tu contenido el de tu blog. Gracias por publicar contenidos como estos en tu página.